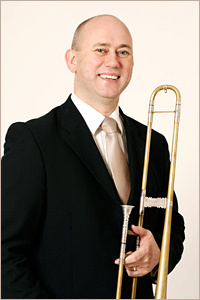 Since graduating from The Royal Academy of Music in 1994, Phil has worked with many of England's orchestras, including Bournemouth Sinfonia, City of London Sinfonia and The Philharmonia. He also makes regular appearances in London West End's Chitty Chitty Bang Bang and The Lion King. Whilst at The Royal Academy of Music, Phil studied the Sackbut with Sue Addison where he has since been an active member of QSCE. He as also worked with many of the leading early music ensembles including King's Consort and Players, Gabrieli Consort and Players, The Sixteen and English Baroque Soloists.